According to death records held by the state of NJ, Thomas Trewin died (1875) of consumption (pulmonary tuberculosis) & his wife Mary Ann died (1878) of apoplexy (a stroke). Both were just 58 years of age. They’d left England in 1857, so they had been in this country for about 20 years. Thomas worked as a carpenter. You may remember that in his teens he served back in England as an apprentice to master carpenter Joseph Binks. They were buried in Evergreen Cemetery, Union County, NJ. Two grandchildren who died as infants were buried with them. I came upon an 1851 census record that holds key information: the places of birth of Thomas and Sarah Trewin! The record also lists their ages which makes it possible to calculate a year of birth for each. In 1851, they were living at 63 Prospect Row in Woolwich, Co. Kent, England. He was 66 and she was 60. We know that his will was proved in 1857, which means he lived to roughly 72. Suspicions that Cornwall was at least one of the birth places was confirmed. Thomas (shipwright, b. 1785) came from a tiny hamlet named Launcells, which is just 3 miles to the east of the coastal town of Bude. Ironically, on a tour that included Cornwall about a decade ago, I visited Bude briefly before heading back up along the coast towards Cardiff. Had I only known then what I know now about the Trewins’ origins! Sarah (b. 1791) was born in Poole, Dorset. I have seen her surname listed in a christening record for son William as both Larsen and Larcom. 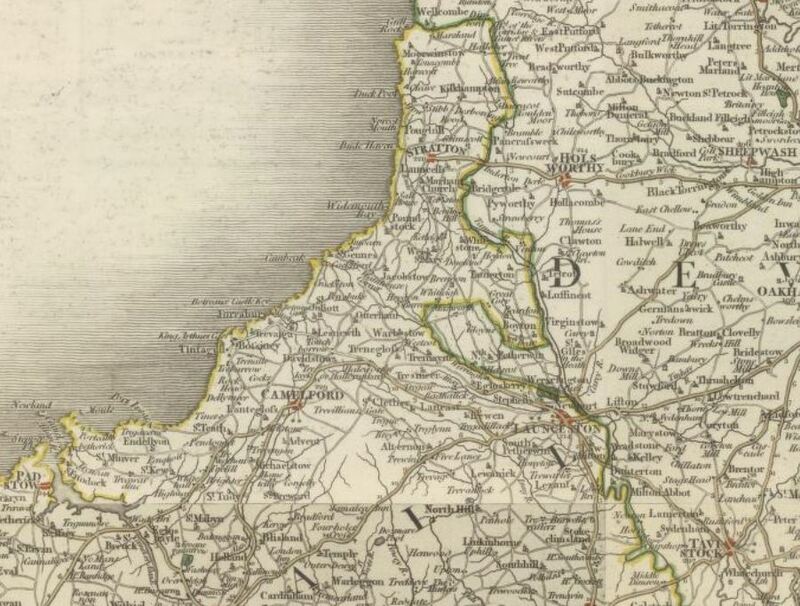 Who knows how Thomas and Sarah would have met each other given the considerable distance between Poole and Launcells. Perhaps their families were both involved in ship-building and that caused their paths to cross. 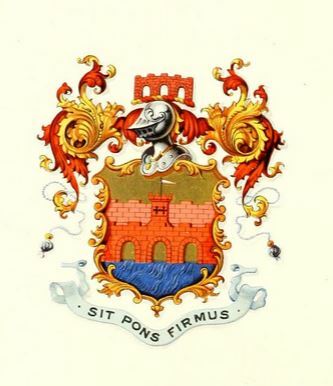 Perhaps Sarah’s father worked in Poole in ship-building and Thomas came to Poole looking for work. 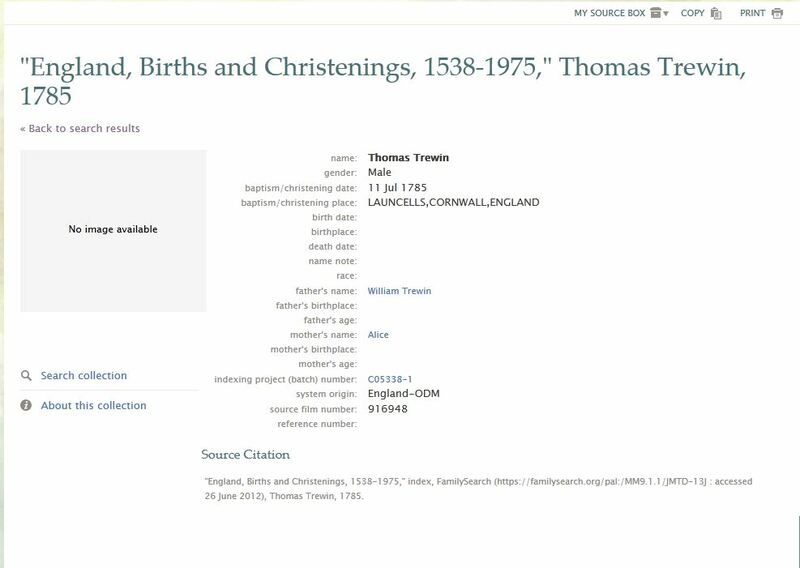 Well, the best news of all is that I went on Family Search and found Thomas’s christening record; it confirms his birth as 11 July 1785, and provides the names of his parents: William and Alice! That enabled me to find Thomas’ siblings: Hannah, Joshua, William, Elizabeth, and an unnamed male. The latter two children were born in a hamlet called Poughill, which is a mile north of Bude. So, given that William and Alice were probably born around 1755-1760, we’re now back to the mid-1700s on our Trewin family line! Hooray! 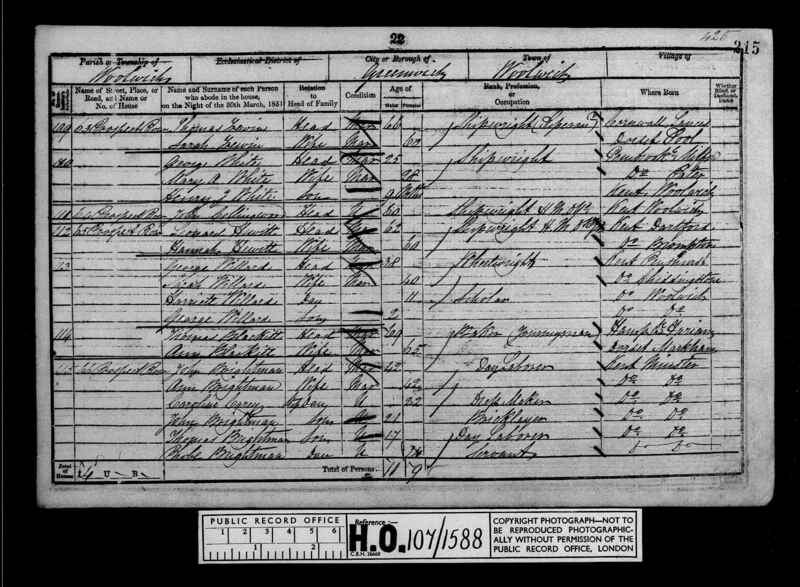 1841 Census record for Thomas and Mary Ann (Phillips) Trewin; Thomas was one of Thomas and Sarah Trewin’s three sons. And, on a side note, I may as well mention here my discovery of an 1851 census record for Thomas and Sarah’s son Thomas’s family. 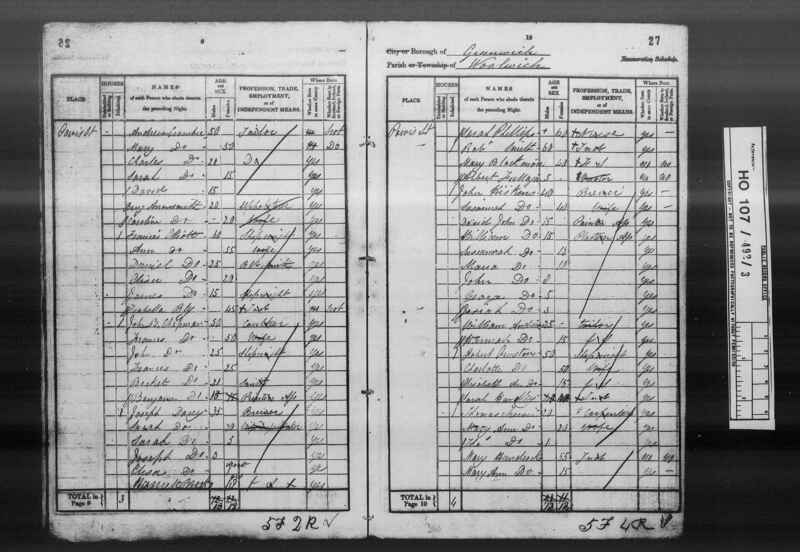 They were living in Lambeth at the time, and listed are my grandfather William (age 5; born in Woolwich) and his two siblings, Thomas (11; born in Woolwich) and Emma (5 months; born in Lambeth). Ten years prior to that Thomas and wife Mary Ann were living in Woolwich; Thomas (the youngest) was just a baby. That’s all for today. See below for an updated Trewin tree showing the first four generations. Now hoping to get back even further! | | |–4-William Trewin b. 21 Mar 1847, Hardin Street, Woolwich Dockyard, Co.
Cary’s New Map of England And Wales, With Part Of Scotland. 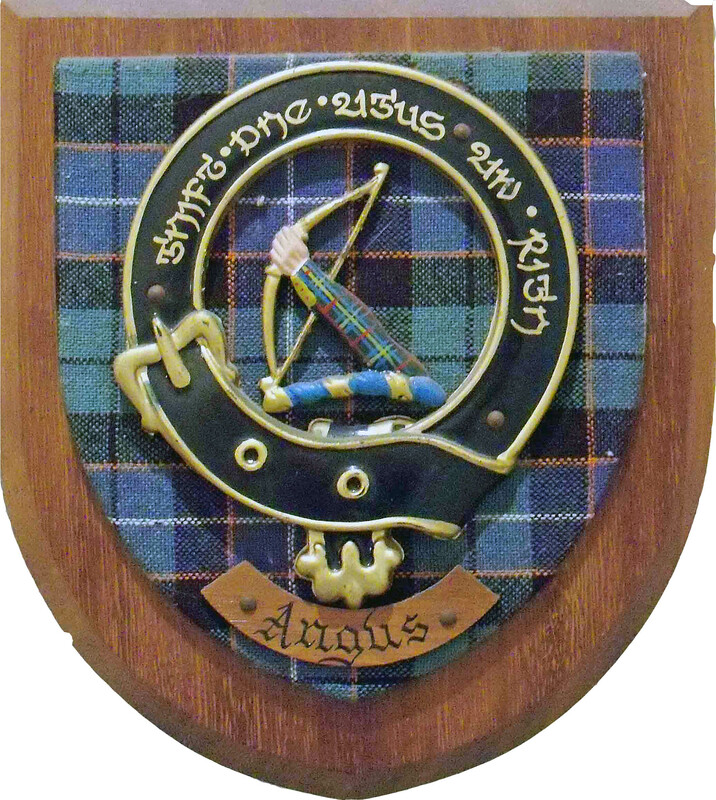 On Which Are Carefully Laid Down All the Direct and Principal Cross Roads, the Course of the Rivers And Navigable Canals … Delineated from Actual Surveys: and materially assisted From Authentic Documents Liberally supplied by the Right Honourable the Post Masters General. London: Published Jun 11th 1794 by J. Cary, Engraver & Map-seller, No. 181 Strand. TMC 43, pp40-47. 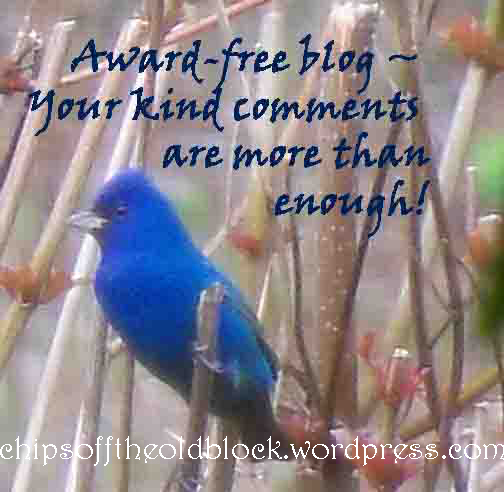 A while back I read an article on pre-twentieth-century weddings and how the bride would not wear white or have a special dress made, but would appear in her very best dress, whatever color of dress that may have been–black, brown, dark green, and so on. Black would have been handy because it could do double duty as mourning attire. 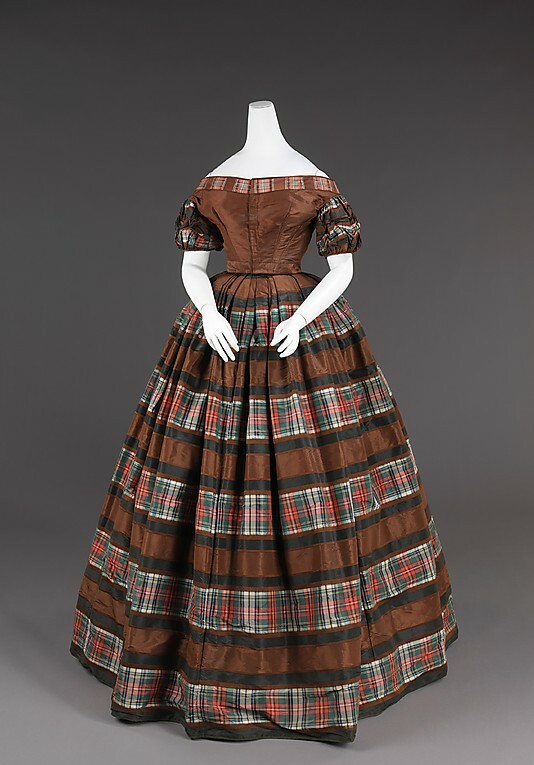 Plaids and florals were also very popular at one time. The idea of purchasing a dress that would only be worn once would have seemed very wasteful, apart from probably being prohibitively expensive (a white dress even more so–imagine trying to clean it without today’s technologies). 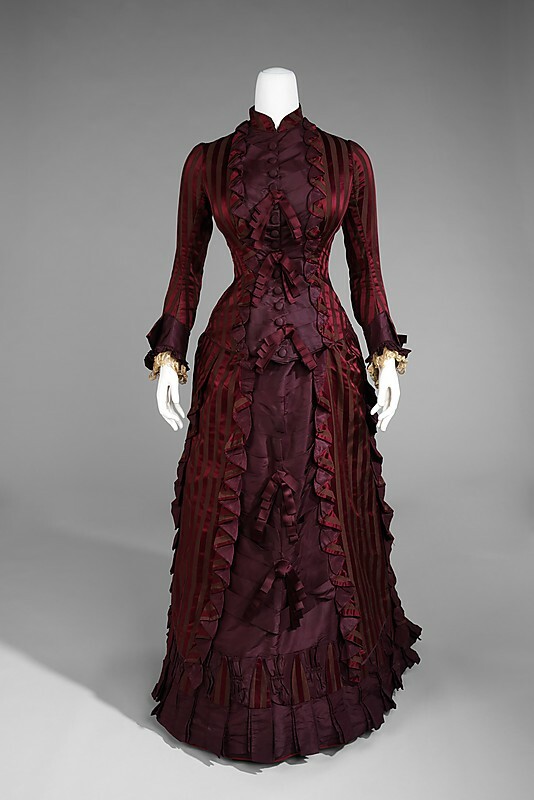 It was only when Queen Victoria married Prince Albert in 1840 in a white satin gown specially made for the occasion, that brides began clamoring for white gowns, but a trend did not really come about until the late 1800s when such dresses could be better produced, transported, and marketed to the public, and were more affordable for the everyday woman. Weddings often took place in the evening at the home of the bride, often on weekdays, particularly on Thursday evenings. This allowed the work of the day (weekends included), whether on the farm or elsewhere, to be accomplished and livelihoods thus maintained. A handy day of week calendar allows you to take any date in history and find out what day of the week it was. I decided to randomly check on some wedding dates I have in my database to see on which days weddings most often fell. As you can see, at least in my little random sample, they fell on all days of the week apart from Friday, with Thursday edging out the other days. 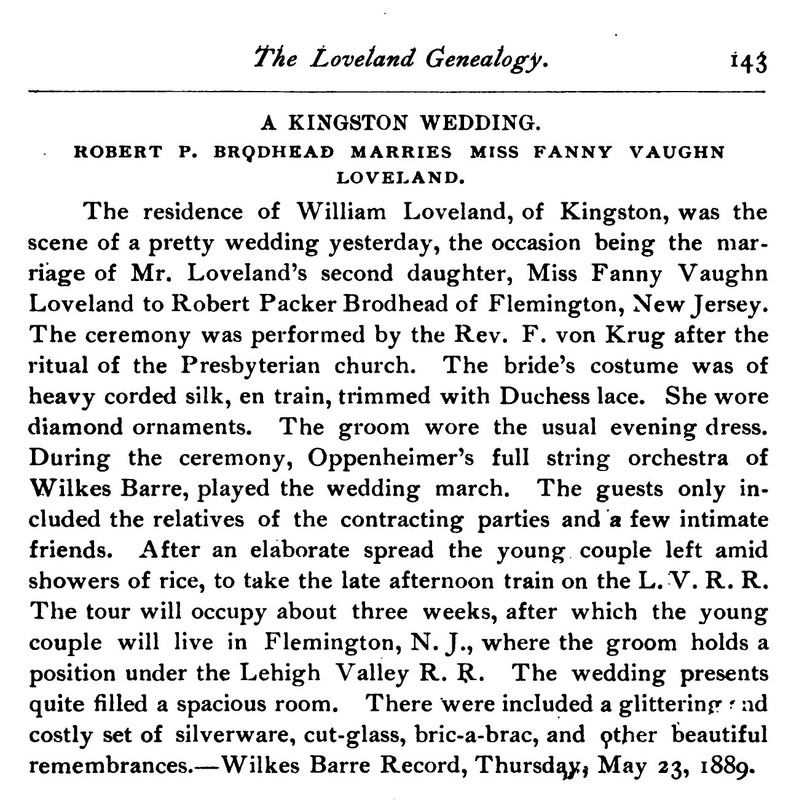 And, while June is now the most popular month for weddings, I only found three ceremonies that fell in that month. 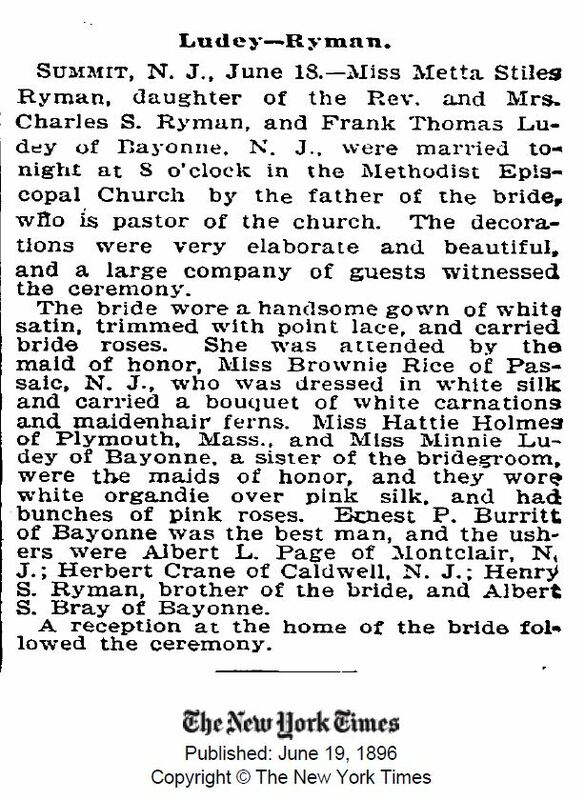 For an interesting article on wedding fashions, visit the Monroe County [PA] Historical Society’s site. I’ll close by including some wedding announcements of various family members. Two have appeared in previous posts, but the other two (of the Ludey siblings) are appearing in this blog for the first time. Wish we had some photos! Some recent digging on the Family Search website helped me find some siblings for Thomas J. Trewin (b. 1817) whose apprenticeship papers appeared in the last post: Sarah, John, Mary Ann, and John. And the search confirmed that baby Joseph was definitely Thomas’s brother. (Last June, I’d written a post about the condolence letter written to Thomas (Sr.) and Sarah Trewin by someone named Featherstone on the sad occasion of Joseph’s passing in 1833. At the time I had been uncertain as to whom baby Joseph belonged.) Parents Thomas and Sarah were Wesleyan Methodists and all the children mentioned above were baptized in the Wesleyan Methodist Church on William St. in Woolwich (Greater London). 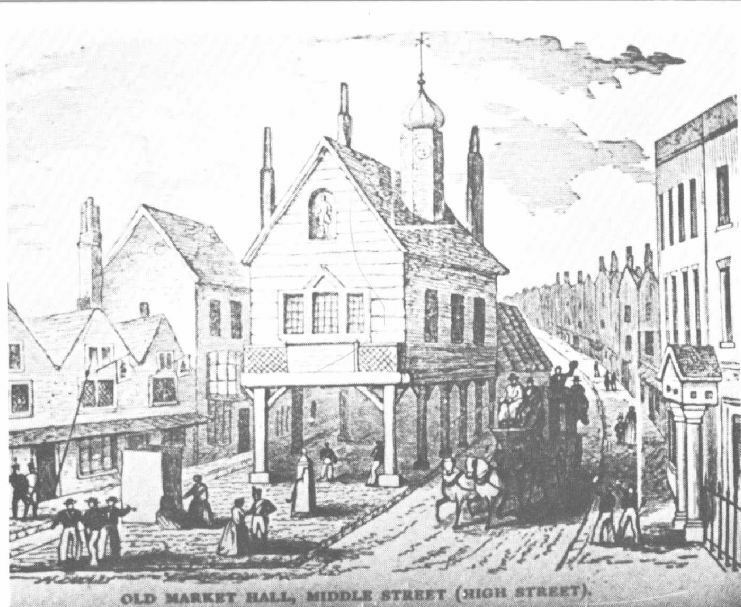 We know from biographical information that Thomas (Jr.) took part in the construction of one of London’s first Wesleyan chapel. Whether it was the Woolwich chapel or one elsewhere, I do not yet know. 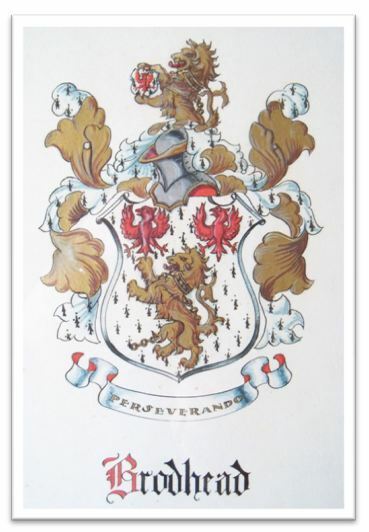 I have always wondered about parents Thomas and Sarah’s own origins since the Trewin surname seems to have originated in Cornwall in Southwestern England, and at one time, most Trewins were concentrated there. So my curiosity was piqued when during my search I found a William Trewin, born in 1812 to a Thomas Trewin and a Sarah Larsen. Now, I can’t be sure that those parents are our Thomas and Sarah, at least not yet, but the fact that William was baptized in the Wesleyan Church–albeit on Middle Street in Gosport, Hampshire (located near Portsmouth on England’s south coast)–is intriguing. Could it be that the couple migrated from Cornwall to Hampshire, had William (and perhaps some other children) there, and then sometime between 1812 and 1817 traveled up to the Woolwich area, perhaps for work reasons or to join other Wesleyan Methodists, and ended up settling there? Descendants of Thomas are welcome to email me for a high-res copy of this certificate. 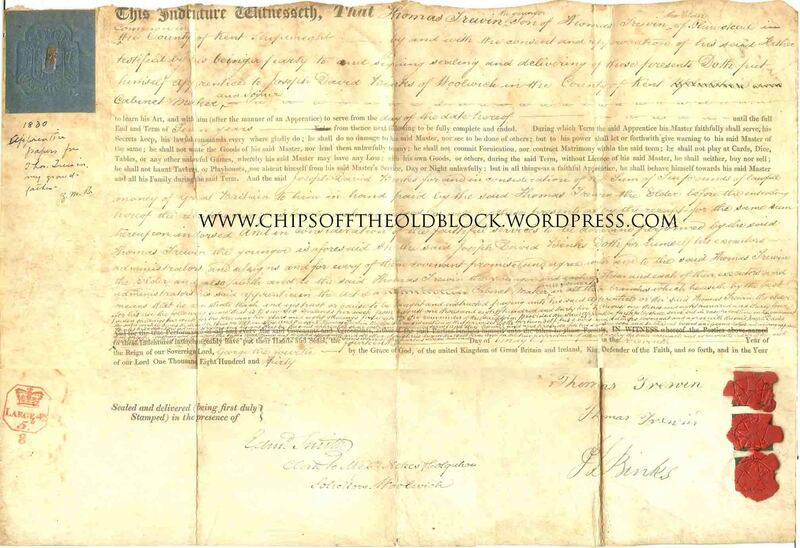 Much to my amazement, accidentally mixed in with a bunch of Woodruff family papers was this 1830 indenture certificate whereby shipwright “Thomas Trewin the Elder of Plumstead” placed his son “Thomas the Younger” into the hands of Joseph David Binks of Woolwich with whom the younger Thomas, at 13 years of age, was to apprentice as a cabinet maker and joiner for seven years. The document is dated May 14, 1830, “the Eleventh Year of the Reign of our Sovereign Lord, George the Fourth by the Grace of God, of the united Kingdom of Great Britain and Ireland, Kind Defender of the Faith, and so forth, and in the Year of our Lord One Thousand Eight Hundred and Thirty.” [George IV–not a very popular guy due to his extravagant lifestyle–died some six weeks later; his brother was crowned King William IV.] 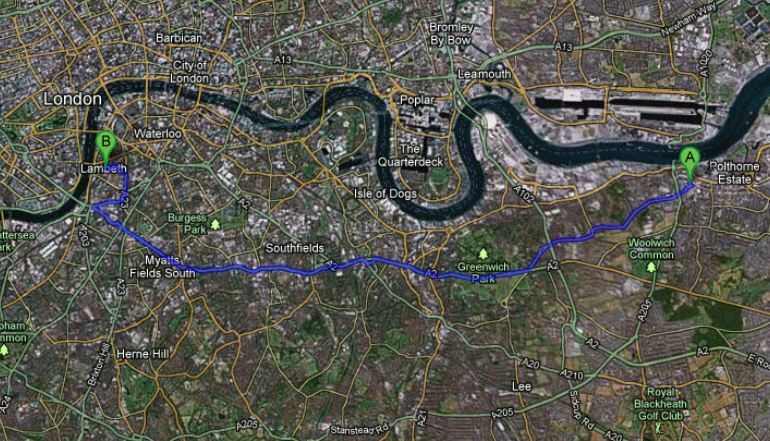 If you click on the links I included above, you will see that Plumstead and Woolwich are right next door to each other south of the Thames; at that time, the towns were part of the County of Kent, but were later (1889) swallowed up by Greater London. Thomas the younger would have finished his apprenticeship at age 20 in 1837, the year Queen Victoria began her 63-year reign at age 18 and the year in which Charles Dickens set his novel Great Expectations. Thomas the Elder gave Binks 10 pounds to take his son on, the equivalent of nearly $1,000 today. From August 1832 to August 1834, Thomas the younger was to receive six shillings per week [about $30 today]; seven shillings per week for the next two years; and eight shillings for the remainder of the contract. The certificate is an interesting read, and the scan is of sufficient quality that you should be able to get down to the fine print. Joseph David Binks’ descendants have posted quite a bit of information on him. He was a master cabinetmaker whose business was situated at 1 Wellington Street in Woolwich. To read more about him, click here. Note: For an interesting synopsis of the history of London’s royal dockyards, Woolwich and Deptford, visit the PORTCITIESLondon website. I can’t tell you how excited I was to see this silhouette of John Phillips, father of Mary Anne Phillips who married Thomas Trewin and sailed with him and their three children on the ship Ion to Quebec City in 1857. The silhouette is quite small, just 3 x 4 inches or so. Someone has done a bit of embellishing with pencil. 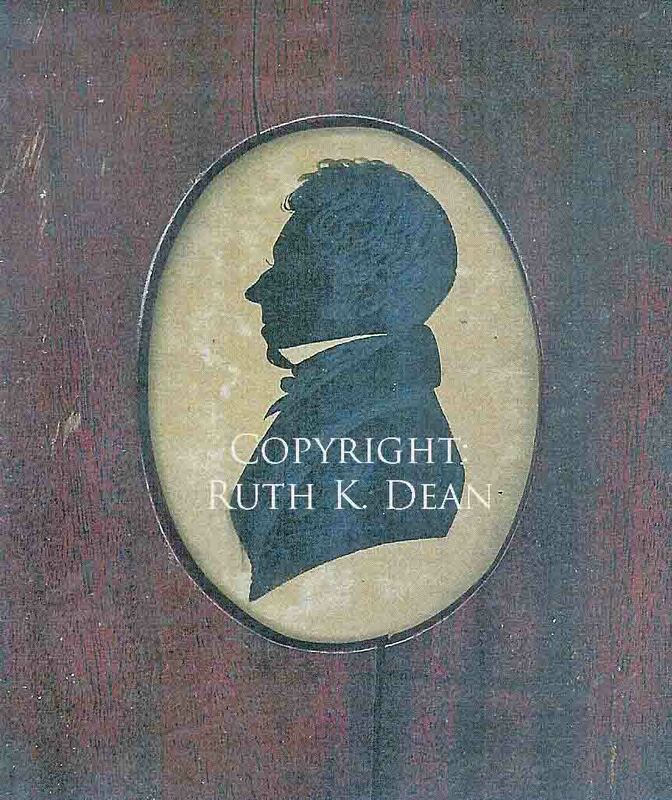 This copy of the silhouette was sent to me by Ruth Dean, a descendant of one of Mary Anne (Phillips) and Thomas Trewin’s children, Emma Trewin Ludey. Ruth has also sent along some great new (to me) photos from that family line, for which I am most grateful. I will post them soon. With luck we will eventually find out more about the Phillips family. Did Mary Anne have any siblings, for example. 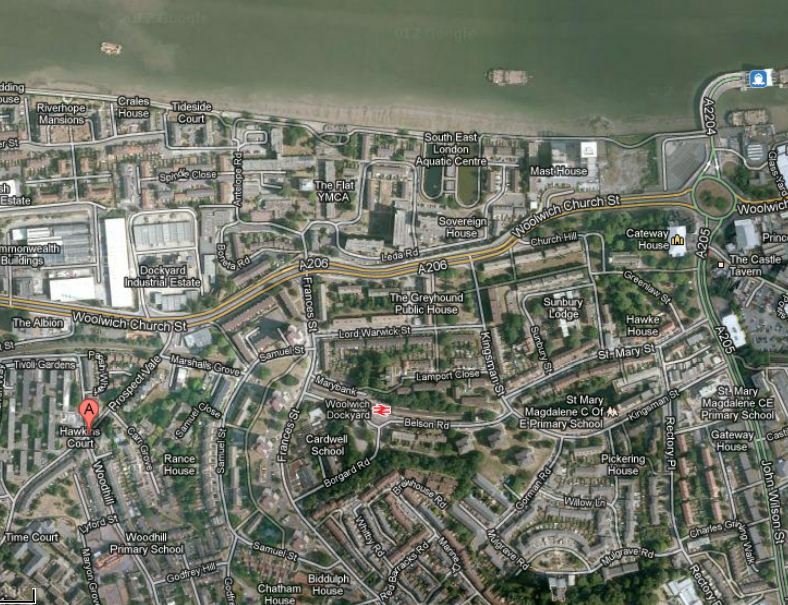 We believe the Phillips lived in the Greenwich/Woolwich area which was once in the County of Kent but is now part of Greater London. Ruth discovered evidence of a John Phillips working as a tin plate worker on Wellington Street. Anyone out there with more information, we’d love to hear from you! John Phillips silhouette from personal collection of Ruth K. Dean family. Used with permission. One lesson I’ve learned well is that all genealogical information gleaned must be viewed with some degree of skepticism unless concrete verifiable sources are provided, and even then you can’t assume 100% accuracy. Another lesson learned has to do with spelling. 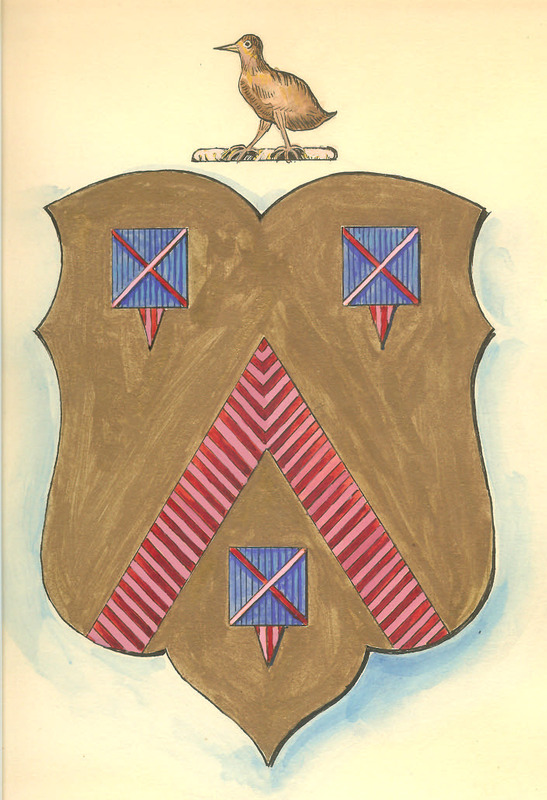 Often family names can be found spelled in a variety of ways, and Trewin is no exception. I found it spelled “Truin,” which surprised me, but then again, it shouldn’t have. Truin and Trewin sound the same, after all. Even first names can be problematic. Sometimes for William, the abbreviated Wm is used. Likewise, for Thomas, I found “Thos.” Or you may see nicknames. In searching for a great grandparent named Elizabeth, I came across her in a census record listed as “Lizzie.” Another family relation, Sarah, was listed by her nickname “Sadie.” So you may think records do not exist for your ancestors when they, in fact, do. You may also have always thought an ancestor had one first name only to find that name was an alternate to the real legal name. I’d always heard of an Aunt Minnie. Eventually I learned her name was Mary. I’ve also discovered that some folks went by their middle names in daily life. I learned, for instance, that my Uncle Ben was Edward Benjamin. Also worth noting is that mistakes can be made in the transcription process. 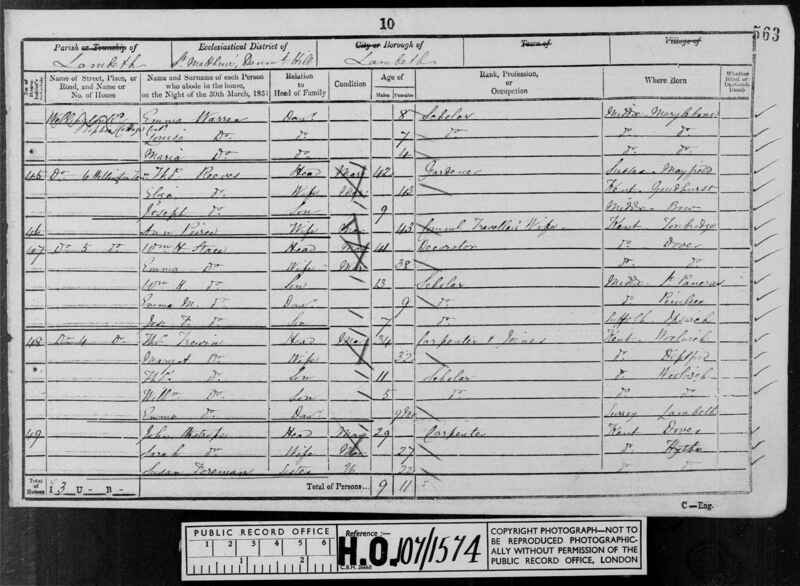 For example, one census had my ancestor Emma listed as “Susan”. When I looked at the original document, I could clearly see that it was “Emma,” but for some reason, the transcriber spelled it as “Susan.” Other mistakes are made by the census takers themselves who misspell names perhaps because of different accents. For example, an ancestor Zillah had her name listed as “Allie” in one census. So, it seems that you may have to tweak names in numerous ways to come up with bona fide (or very likely bona fide) data. Fortunately, when you use a site like Family Search, you can make use of an abundance of filters–something I did not clue in on at first, regrettably, but once I discovered that feature, it simplified searches greatly and presented me with alternatives I might not have considered. In any case, with all that said, I was able to use the Family Search site to trace the Trewins and flesh out the scanty details we had about the family. Of course, I can’t tell you that everything in this post is 100% true, but I can say that there is a high degree of probability that most of the information is reliable as it is based on family papers, NJ Death and Burial records, England Births and Christening records, census records, and other fairly reliable sources. 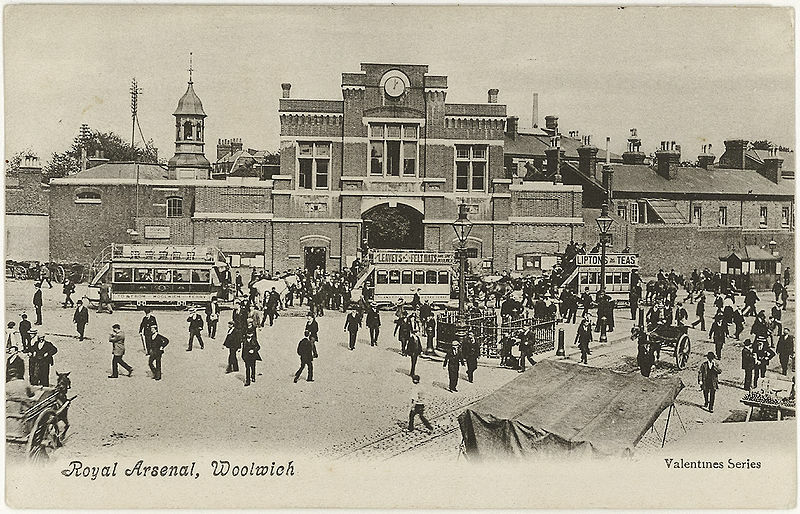 was born in Woolwich,which is just south of the River Thames, on 12 August 1817. He was christened on 7 September 1817 in the Wesleyan Methodist Church on William Street, in Woolwich. Mary Anne was born in 1820. On Rootsweb World Connect, I found someone listing Mary Anne’s birthplace as “Deppard, Co. Kent, England,” but I have not been able to find a place called “Deppard” so I am not sure what to make of that information. Most likely this is Deptford, a town south of the River Thames now part of Greater London rather than County Kent. As per the previous post, the pair emigrated to Canada in 1857 and two years later moved to New Jersey, initially settling in Jersey City. According to NJ Deaths and Burials, Thomas, who died in Elizabeth, NJ, on 19 September 1875, had been a carpenter (listed under “Thos. Truin”). He was buried on 22 September 1875 in Evergreen Cemetery in Union County, NJ. 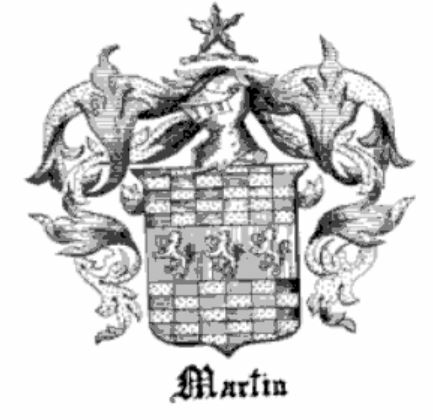 I learned (also from NJ records) that Mary Anne passed away on 30 May 1878 in Elizabeth, NJ, and was buried on 2 June 1878, in Evergreen Cemetery as well, next to Thomas. The two were both just 58 years old at the time of their passing. 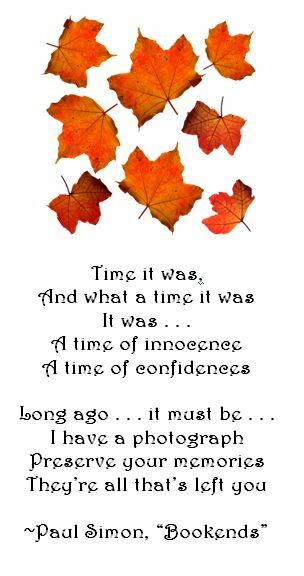 Although I don’t have photos of Thomas or Mary Anne, I do have photos (in this post) for their son William and his second wife Elizabeth Sargent. William, as you may recall from the previous post, had a biography written about him. He was born in Woolwich, Kent, on 21 March 1847. He was too young to serve in the Civil War and worked in the Commissary Department. He was thrilled to meet President Lincoln at some point during his service. William became a US citizen 0n 26 October 1868. He graduated from Bryant and Stratton Commercial College of NYC the previous year, and from 1867-1868 worked for New York Scientific Magazine. From 1870 to 1890 he worked for the Tidewater Oil Company. 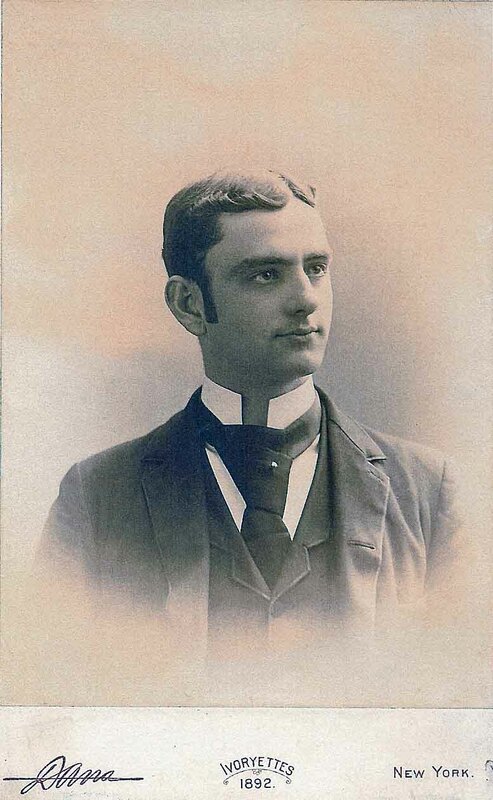 In 1896 he established the Trewin Supply Company and sold the company 18 years later. He remained there as a manager until his death from a stroke on 4 December 1916 in Elizabeth (NJ) General Hospital. He was buried in Evergreen Cemetery near his parents. 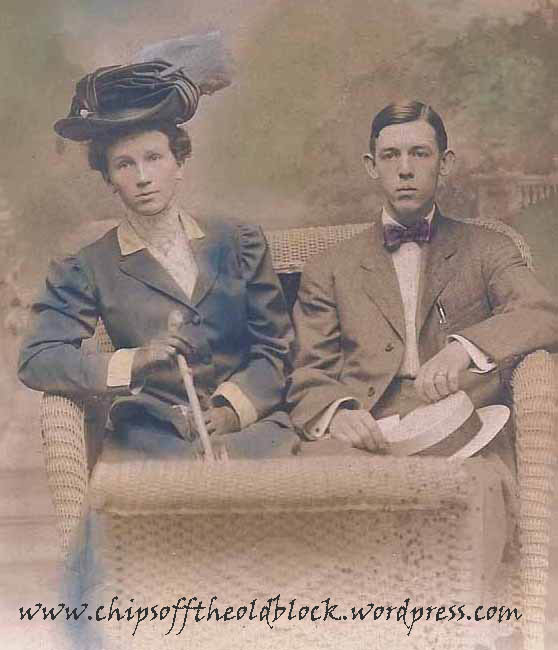 Eventually older son “Clarence” (born 9 April 1869) married Vivian Reynolds Cross on 3 June 1896 in Manhattan. From what information came down through the family, I understand the couple initially lived in the NYC area and eventually ended up in Camden, NJ. I’ve heard they had a large number of children, but thus far, I have only discovered three: Earl, Vernon, and Roy. “Clarence” may have worked as a journalist at one point. In any case, he was heavily interested in politics and ran for office in NY state at least once (he lost on that occasion). 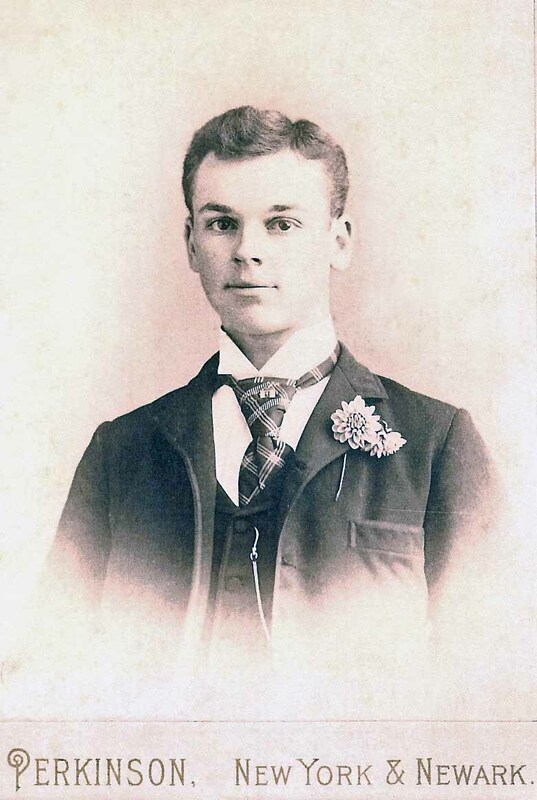 The younger son of William Trewin and Edith Fry, “Bert” (b. 26 June 1871) spent the majority of his working life in Pittsburgh. Apparently he climbed quite high up in US Steel. He was first married to Georgie Francis Duke. 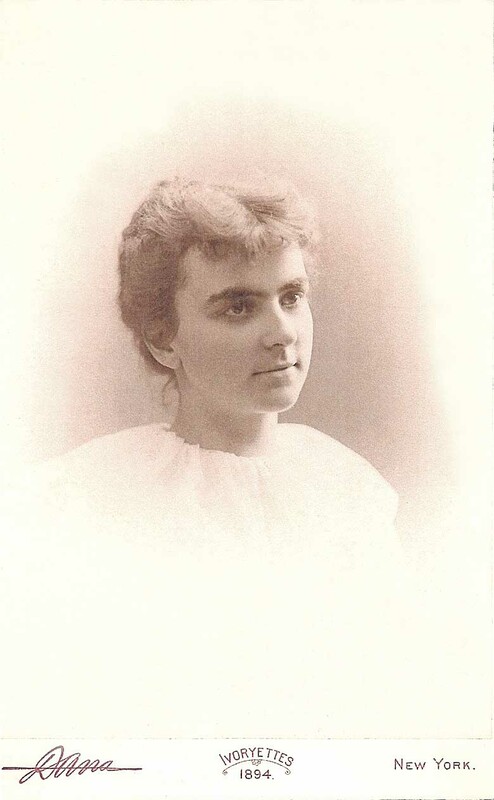 She passed away from influenza in 1917. Together they had three children: Elmer Archer, Albert Gray, and Edith May. “Bert” later remarried Jessie Mallette Smith. “Bert” passed away on 19 April 1948 in Orlando, FL. He and his two wives are buried in Allegheny Cemetery (Find a Grave link) in Pittsburgh.